“Sit! Stay! Stay Man Ray!” (Not Man Ray, the artist, but Man Ray, William Wegman’s first Weimaraner dog.) “William Wegman: Being Human” is a survey exhibition of thirty years of photographic work at the NGV International. Wegman’s photographs combine two things that he enjoys: art history and Weimaraner dogs. Wegman’s Weimaraner dogs are his willing, loyal and obedient muse. Does the dog’s expression change when it is wearing a wig or standing on a box? Or, am I just projecting my perception of emotions onto the dog? What are his dogs thinking when he photographs them? As Wittgenstein wrote: “If a lion could speak, we could not understand him.” Meaning that the life of another animal is structured so differently to our own that even a shared language would not be common ground for communication. Wegman believes that his second dog Fay Ray had pride in her work, her balance and poise; maybe she did, maybe she just want to please him. One thing that I am sure about that they are not thinking about is art history or how it can be funny. And Wegman’s photographs are funny and his dogs are the ultimate deadpan-looking ‘straight man’ in this routine. If we have learnt anything from the social media it is that pet photographs dominate, so it is not surprising that Wegman’s photographs are popular. Wegman has been photographing his dog since 1970, long before social media. Large format Polaroids create a unique photographic print, the complete opposite of digital photography. I’m not into dogs, I am more of a cat guy and I not into putting clothes on animals. I’m not sure if this simply an aesthetic choice, or a matter of taste, but that it might reflect deeper ethical and existential considerations. So there is too much Cindy Sherman and not enough Sol LeWitt in this exhibition for my taste, however, I still enjoyed looking at Wegman’s light-hearted take on art history and his dogs. The Coburg Plan is a paperback book of photographs, essays, stories, a poem, even some comments from Scott’s Instagram feed focused on the architecture of Coburg. Jessie Scott is described at the “principle artist” and it is an affordable, accessible kind of artist’s book. I have lived in this inner northern suburb for decades, I helped crowdfund the book and was at its launch on Saturday at the Post Office Hotel. At the launch there were speeches, a reading of the poem by Timmah Ball and the kind of gastropub food that the PO Hotel is now well known for. I can remember when the Post Office Hotel had a different reputation; it was further down the pecking order than the Moreland Hotel with its strippers and pokies. It was the kind of place where some guy would come around to your table asking for a cigarette. Now, it has changed. The Coburg Plan is neither a celebration nor a condemnation of the changes; it is a neutral look at the often anaesthetic nature of suburbia. It is an elegantly designed book with type set in Brunswick Grotesque, an easy to read san-serif font and a near perfect choice of hyper-local typeface donated by its designer, Dennis Grauel. Kyle Weise’s essay is a good introduction to Scott’s photographs. Weise examines the history of banal suburbia in architecture and in photography; from Robert Venturi Learning from Las Vegas to David Wadleton’s photographs of Melbourne’s milk bars. It is the antithesis of the modernist architectural vision that Robin Boyd writes about in his The Australian Ugliness, but it is a feature of ordinary, banal reality. Scott records the mundane details of suburbia in her photographs. The old houses and closed corner shops, the empty lots, a ghostsign revealed during demolition, and the construction of new units. There is the street sign dealing with the fact that there are two streets in the suburb with almost the same name Hutchinson Place and Street; Australia street names makes up in repetition what they lack in originality. It is a Coburg ‘plan’; ‘plan’, not as in an advance arrangement, but as in a representation or artist’s impression. I take most of the photographs on this blog, so I thought that I’d put together a slide show of some of the best. The photos appeared on the blog from 2009 to 2018. I knew that I would see some art galleries and street art when I went for a walk around Fitzroy and Collingwood. I didn’t have a specific agenda or plan for my walk, there is always something new to see in the area and not just in the galleries. When I started blogging I had a real sense of exploration, I would go looking for new galleries. I yearn for that sense of exploration now but sometimes it feels easier just have to keep doing the rounds of certain galleries and familiar street art locations. Now walking down Flinders Lane or along Gertrude Street seems to be the most efficient way to find an exhibition to review in a blog post. I was looking for Bside Gallery because I had heard of it so I don’t know how I missed seeing it; I must have been momentarily distracted as I pasted by the shopfront on Brunswick Street. I did end up seeing a gallery that I haven’t visited before, Besser Space. At Besser Space was “Eve, a photographic exhibition” by Zo Damage of women in rock. Zo Damage claims to be “Melbourne’s busiest music photographer” and she might be; she is half way through her 365 Day Live Music project to photograph a live band a day for an entire year. Not including the hundreds of photos in her 365 Day project there are a lot of black and white photographs in this exhibition, fortunately Besser Space is a large rough warehouse space, perfect for an exhibition of rock photographs. A dozen surreal paintings by the São Paulo based artist, Yusk Imai hang in his exhibition “The Moratal Drama” at Backwoods Gallery. Imai’s paintings combine painting and drawing with marker pen on canvas. They are a mix of patterns, arty splatters and delicately drafted figures. His surreal forms stand, often on plinths, in the surreal locations of the forest or the empty desert in the rain shadow of the mountains on the horizon, stuck contemplating their absurd but beautiful existence. Gertrude Contemporary had a group exhibition of its usual contemporary art. I was unlucky with the galleries as many installing new exhibitions, like the CCP and Collingwood, or undergoing major renovations, like Hogan and Kick. Not one of my more successful gallery crawls. On the other hand I did see some interesting things on the street, had a walk in the sunshine and a delicious lunch. The most photographed public sculpture in Melbourne is probably Larry La Trobe or The Three Businessmen… because of their potential for selfies. The most televised public sculpture in Melbourne is Lady Justice by William Eicholtz because there is a shot of it in almost every story on a County Court case. I have some experience in photographing public sculpture for this blog. I did take a few of the photographs in my book Sculptures of Melbourne but most, like the cover photograph by Matto Lucas, were taken by professional photographers. Here is some practical advice to people on photographing public sculpture and then some advice on copyright issues regarding photographing public sculpture in Australia. There isn’t any technical information and my only advice regarding equipment is a telephoto lens for sculptures high up on buildings. To get a good photograph of a public sculpture you will probably need to visit the location twice to determine the best time of day to take the photograph as you can’t get the sculpture to turn to face the sun. It is pointless trying to photograph a sculpture with the sun behind it unless you just want its silhouette against the sky. Bronze sculptures on plinths are particularly difficult to photograph, but many modern and contemporary sculpture can be viewed and photographed from all angles. However, just as you thought that sculptures stand still they are moved, or building works occur around them and they are fenced off, or they have been ‘capped’ by a tagger or sticker. The first time I went to photograph David Bell’s Raising the Rattler Pole – The Last of the Connies just after it was installed in 2013, it was surrounded by fencing and there were workers rebuilding the corner. I had to hold my camera above my head to take some shots over the fencing. Not the best way to photograph a sculpture and so I returned a few weeks later. Photographing a sculpture may involve cleaning up the site, removing rubbish wedged in parts of the sculpture and wipe the sculpture with a dry cloth to remove spider webs and dust. While photographing King’s Sun Ribbon at Melbourne University for my book Fiona Blandford had to remove the rubbish left behind by the builders working nearby. In Australia you do not need copyright permission to publish photographs of sculptures that are permanently installed in a public location. The laws are different in other countries. For more on this see the Arts Law Centre of Australia, “Without my Permission: photographing public sculptures” by Jasmine McHenry. In Australia you only need copyright permission from the artist to publish the photographs if the sculpture is temporary. This includes illegal temporary street art installations. So I had to track down every street artist whose sculptures that I wanted to have photographs of in the book, not exactly the easiest of tasks. Sometimes I felt like a detective working from an obscure clue: who was the street artist who signed his sculptures with GT? Determining if a sculpture is permanent or temporary may also be more complicated than the drafters of the law anticipated but I didn’t run into any problems with this with my book so I tried to err on the side of caution. The underwater views of a lily pond are fantastic, new world’s waiting to be discovered like alien planets. They are Catherine Nelson’s Submerged at Gallery Smith in North Melbourne. In the neo-baroque spirals of her underwater flower arrangements fish replace the insects and lizards that inhabit the baroque bouquets of Dutch still life paintings. The spectacle of dramatic point of view, often looking up to the surface of the water, exist to astonish the viewer. Of course they aren’t real but then neither were the baroque paintings of flowers. Catherine Nelson’s artfully digitally manipulates photographs, assembled from cutting and pasting many photographs, the way that you might assemble a flower arrangement cutting and placing the flowers. Nelson has extensive experience working in visual effects photography for films including 300, Moulin Rouge and Harry Potter. Time is compressed in Nelson’s underwater worlds: everything is budding, flowering and decaying simultaneously. The baroque never died, its demise was contrived for the purposes of progress in art history. Now the baroque has returned with Nelson’s photographs and there are many examples of other Australian neo-baroque artists including Juan Davila, Vincent Fantauzzo, William Eicholtz, Bill Henson, eX de Medici, Sam Leech, and Sophia Hewson. For more on the Neo-Baroque as an international trend read Angela Ndalianis Neo-Baroque Aesthetics and Contemporary Entertainment (MIT Press 2004) and Gregg Lambert The Return of the Baroque in Modern Culture (Continuum, 2004, London). Gallery Smith is in an art deco brick building on a quiet street in North Melbourne with the main gallery spaces on the ground floor and a project space on the first floor. Louise Gresswell’s exhibition, Imprint in the project space is a series of loose, informal, abstract mixed-media paintings, not large enough to be impressive, not ugly enough to be interesting. On Friday 13th of November at Blender Studio there was 32K, a one night only exhibition of David Russell’s photography. Russell’s first exhibition took his photography beyond simply documenting street art and graffiti to making his own art. 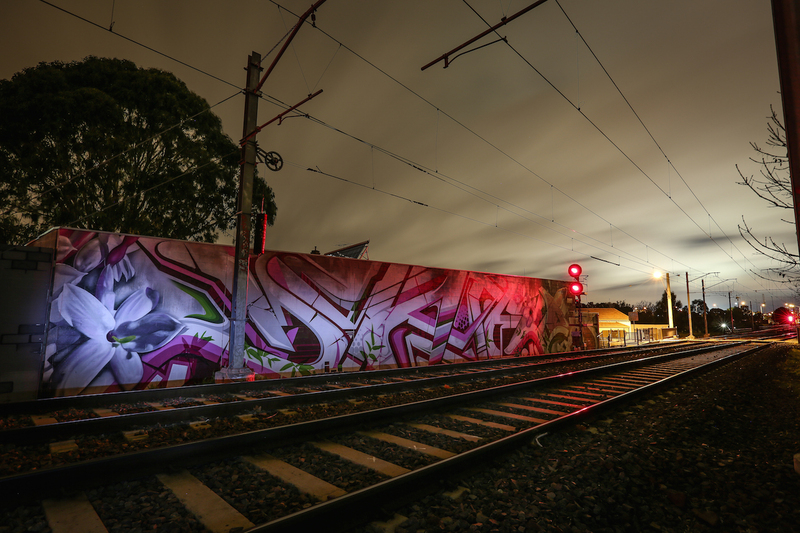 Adopting the attitude of graffiti writers to the urban environment; the trains, getting up high and exploring the urban environment. Only Russell is using a camera rather than a spray can and painting with light and darkness. The photographs have the same chromatic intensity of aerosol paint. Not all of photographs had graffiti in it, three photographs at Flinders Street Station did not have even a sticker or tag in them but still had that attitude. 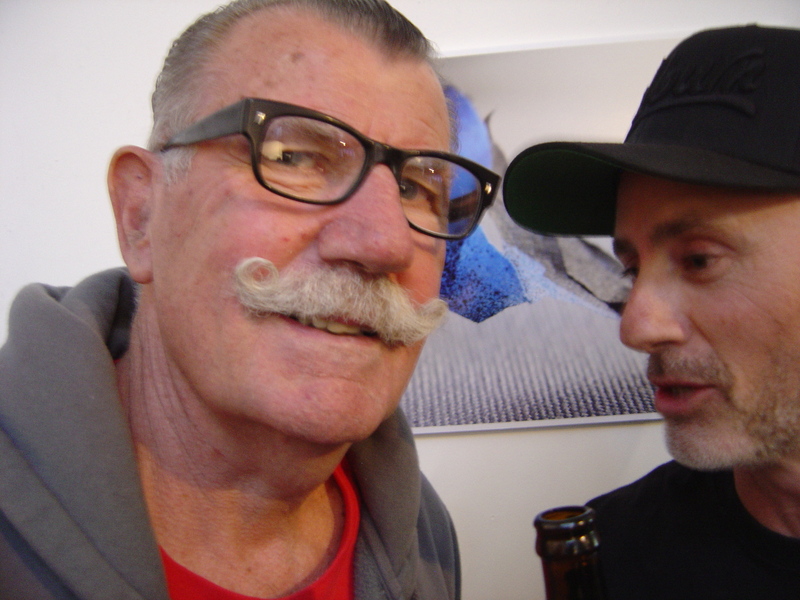 The exhibition brought out many people notable in Melbourne’s street art scene to support Russell. One wall of Blender Studio was covered with a wallpaper print produced by GT Sewell’s new business. Dean Sunshine supplied Mexican beers for the event. For although this was Russell’s first photography exhibition he is already highly respected in the scene. Years ago when Facter first mentioned David Russell he said something like: “He looks like a cop; he isn’t, I’ve checked him out.” Graffiti writers and street artists have every reason to be suspicious of this short haired man with a big camera who was always hanging around watching them paint. Was he an undercover cop gathering evidence? There are many photographer capturing the Melbourne’s street art and graffiti scene. I’ve done a bit of that myself and this is how it started for David Russell. However Russell was not just another photographer snapping shots of Melbourne’s walls. He was devoted to it, he was always there with his camera for as long as necessary. He was there for days in 2014 photographing Adnate paint his mural in Hosier Lane. This dedication led to Russell doing a long running series of monthly posting on Invurt blog; Through the Lens. His knowledge of the artists and scene lead to him to become more involved with various projects and doing street art tours.